It is spring! Or, it is supposed to be spring here in this area of the world. In spite of the cold days we've been having, I have started planting my garden. 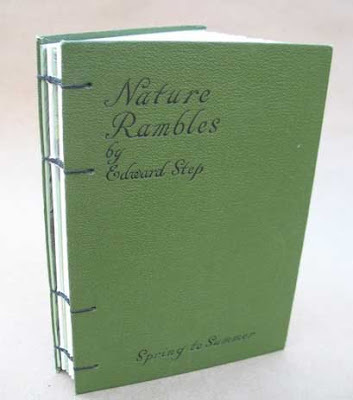 So as spring rambles on into summer, this exposed spine garden journal by UsefulBooks caught my eye. As an extra treat, if you click through to UsefulBooks.Etsy.com to see the other photos of this book, you can see the fabulous marbled paper, custom made for this book, used for the endpapers inside. This journal has pretty pages includes from an old children's book, as well as pockets, and lots of blank pages for writing; a very useful book! Thanks for featuring my little book, Rhonda! It's found a new home, I'm sure due to being showcased here. THANKS SO MUCH!